With this exhibition, Judith Poxson Fawkes’s richly woven tapestries present a profusion of color and pattern. Vibrantly colored designs range from pure patterned abstraction to suggestive representation. Viewers will be absorbed by mesmerizing designs that range from interlocking squares and diamonds to boldly colorful hints of mountain and waterscapes. All of Fawkes’s weavings offer a unique sense of volume and depth in two dimensional space. The added opportunity to see tapestries that reach back to Fawkes’s early career shows both evolution and continuity in her work. The unique technical qualities and visual elements of woven design, allow Fawkes to define and determine shape through interwoven colors and the weft and warp of her tapestries. She utilizes both double weave and inlay techniques. The results are shimmering forms that undulate across fields of color, often creating 3-dimensional illusion. Portland artist Judith Poxson Fawkes received her MFA from Cranbrook Academy of Art. She has exhibited her tapestries nationally since the 1960s, and her work is in numerous collections including the American Crafts Museum, NY; City of Seattle; Clark College, Vancouver, WA; Greenville County Museum of Art, SC; Knight Library, University of Oregon, Eugene; and Stanford University, Palo Alto, CA. She has completed many commissions including work for the Aurora Municipal Center, CO; Knoxville Convention Center, TN; St. Helena Hospital, Deer Park, CA; PERS: Public Employee’s Retirement System, Portland, OR; Mark O. Hatfield U.S. Court House, Portland, OR; and most recently Tigard Library in Tigard, OR, and Stoller Vineyards in Dayton, OR. 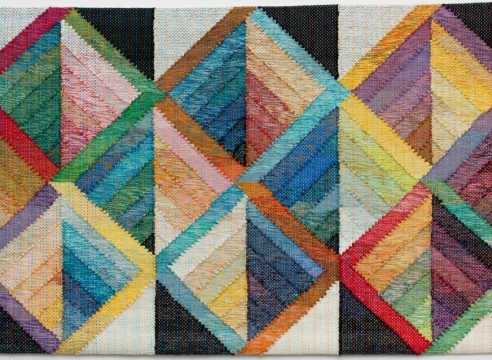 Recently, her work was included in “Thread of Life,” an exhibition featuring national textile artists at the Museum of Fine Arts, Florida State University in Tallahassee.